How to Protect Your Prune & Plum Trees | Mr. Tree, Inc.
Should I Be Worried About the Western Tent Caterpillar? Humans have been cultivating plums for millennia, with different uses and preparations appearing in cultures from all over the world. From the simple dried prune to the pickled umeboshi of Japan, it is one of the most versatile and diverse tree species we have. And, with summer quickly approaching, it is important to know how to properly care for and protect your prune and plum trees. Portland trees are subject to a wide host of pests and threats, and having knowledge of how to keep them safe will give you happier and healthier trees for years to come. Make sure you understand your circumstances before you begin using pesticides. Every Portland tree owner’s situation is different, and it is important to take those variables into account before doing anything. Things like the age, size, and number of trees will alter the way you go about protecting them. Most labels on pesticides will indicate the proper schedule of treatment, along with the amount of water necessary for dilution. Be aware that most often these are instructions for a middle age and density orchard with moderate test pressures. Adjustments should be made depending on the number and age of the trees, as well as with the level of pest presence. Use common sense as only you know the exact details of your trees. Be careful and read the directions thoroughly as some labels indicate dilute applications only. Pay attention to the compatibility of the tank mixes as well, as this can weaken the effects of the pesticide. For example, the pH level of some boron spray solutions can make insecticides less effective. Use adjuvants and spreader stickers with caution, they can cause a drop in effectiveness if used improperly. Protecting your prune and plum trees is an ongoing battle, and part of that entails knowing the different stages your tree goes through each year. The kinds of pesticides and threats your trees will face changes over the course of the year, and using the wrong product at the wrong time could leave your trees vulnerable. The environment around Portland trees during the dormant season is vastly different to the environment in late Spring and Summer. Knowing what products are needed when is crucial to the care of your trees. You should, however, not use more than one product for a pest unless a combination is expressly indicated. Keep detailed information on any and all pesticides you are using at any given time. It is also recommended that you rotate your sprays to avoid building up a resistance. Knowing the stages of your trees is important, but that is only half of the battle. Familiarize yourself with the pests you need to protect your trees from in order to better combat them. You should be familiar with the various insects, mites, fungi, and diseases that can hurt your trees. Some pests go through multiple generations in a year, meaning you will have to be prepared to combat them more than once. You should also be monitoring your trees for signs of pests early on. The sooner you can begin to take action, the less damage your trees will have to endure. Tree trimming will keep them looking best and producing more. Understanding the life cycle and behavior of your pests will give you a significant advantage over them. Not only will you know how to eliminate them from your trees, you might be able to find less aggressive solutions and keep heavier chemical sprays away from your fruit. The coddling moth, for example, can be dealt with Cyd-x. Cyd-x is a virus that is harmless to everything except for the moth, allowing you to specifically target it without having to resort to more toxic pesticides. Aphids, another common pest for prune and plum trees, are also easily removed from your trees with the use of ladybugs. The Pacific flatheaded borer has caused many a new tree owner undue grief, burrowing under the bark of young or stressed trees. However, they can be easily kept at bay by practicing proper shading and watering techniques and careful monitoring. Small insights into the pests you deal with like these can keep your trees safe, while also avoiding more aggressive treatments that can cause harm of their own. It should go without saying that the most important thing to remember is your own safety. All new pesticide labels will clearly explain the orchard reentry labels and personal protection equipment information. Pesticides are toxic, and they should always be handled with care. Never hesitate to use additional protective clothing or safety precautions. Portland trees need our help to thrive and flourish, but it should never be at the expense of your own health. It is also a good idea to keep your use of toxic chemicals to a minimum, either by using low-impact products or non-toxic solutions like pheromone traps. You should also be sure to regularly care for your trees by remembering to prune and fertilize them properly. This can lead to overall healthier trees, which in turn can require less use of pesticides. If you ever feel uncomfortable or out of your depth, you can always call a professional arborist. Expert help is one of the best resources to have at your disposal. Humans have been keeping plum trees since the Neolithic period, and we have more tools to protect our trees now than ever before. 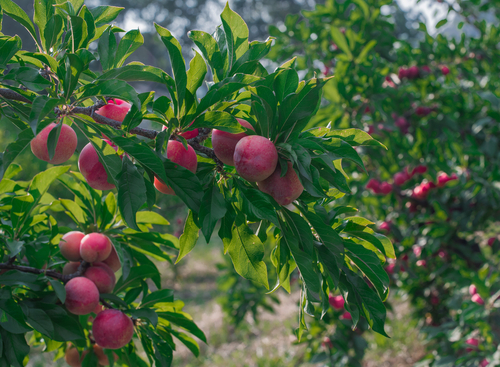 Caring for your trees properly links you back to the long tradition of cultivation and care of prunes and plums. Be sure to know the life cycle of your trees well, and catch any pests or diseases they might be fighting early on. Proper protection and maintenance of your trees is the most important thing you can give them As long as you are willing to put in the time and energy to research and care for your trees, you will get to watch them thrive and flourish for years and years to come!